Guarded by treacherous waters and home to dramatic landscapes, Scrub Island is a magical island that is little-known to visitors and rarely-visited even by locals. Anyone who knows Scrub generally knows it for its mysterious stories. The island's half-finished and abandoned hotel, notorious Deadman's Bay, the plane crash site. You can read more on exploring in-land Scrub Island here. 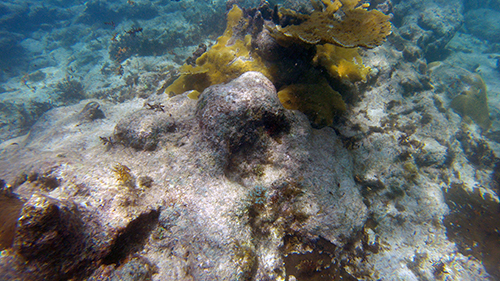 What we didn't know was that the waters that surround Scrub are just as, if not more, fascinating and diverse. 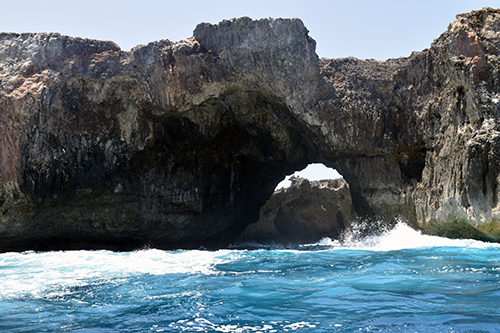 It is home to giant blow holes, the roughest waters in Anguilla, shipwrecks and enchanting sea caves. 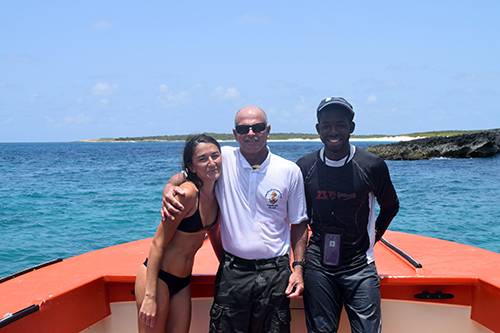 Together, Nori, Kirmani and I decided to jump into the unknown and see a completely different side of Anguilla - Scrub Island from the sea. 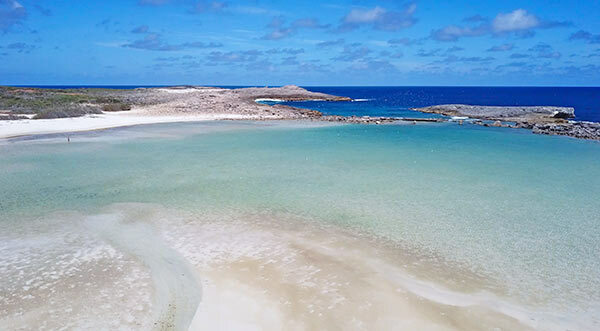 For a video peek at Scrub Island, check out our Scrub Island video below. It was filmed a couple of years after this page was written. It covers all of the amazing Scrub Island sights, including infamous Deadman's Bay. If you want to really see Scrub Island, there is only one man to call... Nature Boy. Hailing from Island Harbour, Nature Boy is a true blue man of the sea. He is not just a tour guide. 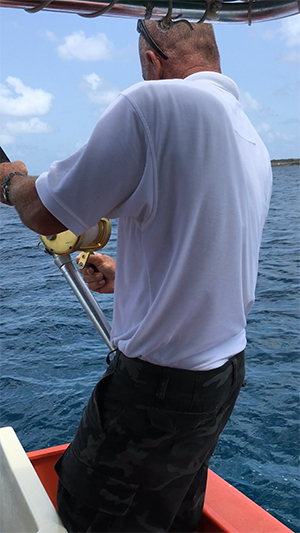 He is also a commercial fisherman with years of experience fishing for big catches on the high seas north of Anguilla. 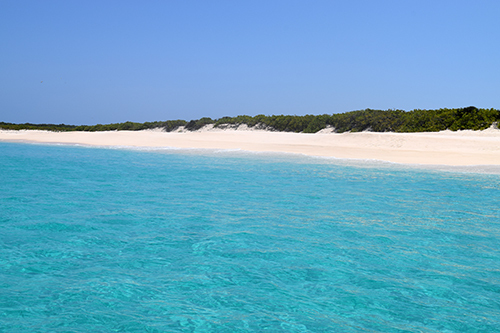 He knows Anguilla's waters like the back of his hand, and he knows Scrub Island even better. You are in safe hands with Nature Boy. 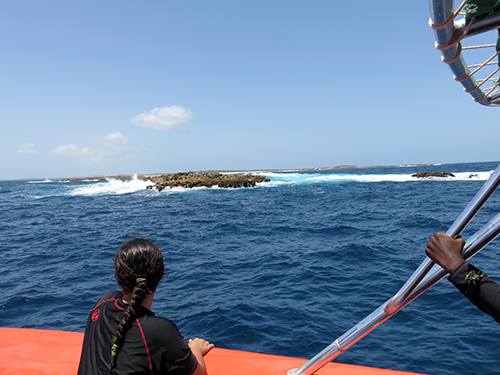 And then, Anguilla's mainland came to an end and Scrub was on the immediate horizon. Edging closer to the coast, Nature Boy took us along the shore of Scrub's untouched, big beach. Calm as a pond that day, it is known for its powerful and pristine waves in winter months. 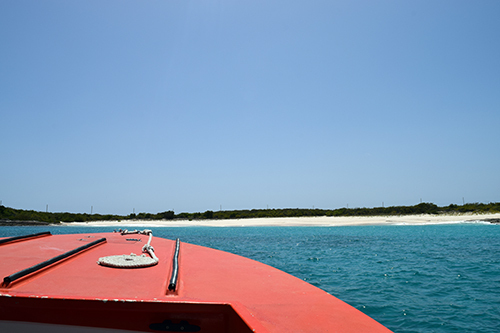 Soon we were drifting towards Little Scrub, a tiny cay off of Scrub Island's mainland. The water turns dark blue, the breeze picks up, and here - the cliffs are high. It's hard to believe that this is Anguilla. 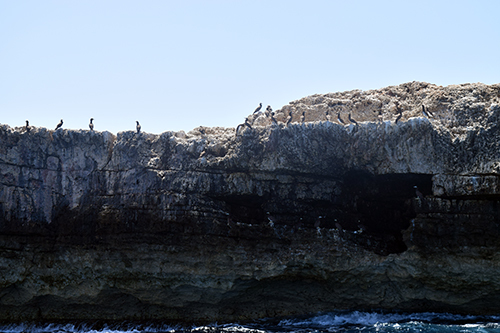 Hidden amongst these cliffs are giant blow holes. They take your breath away. 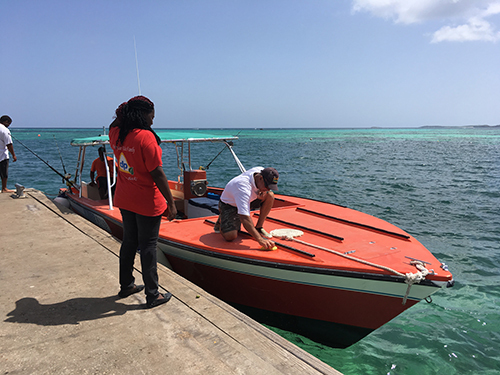 As the ocean waves dipped below sea level, the boat went with them, calm at first. 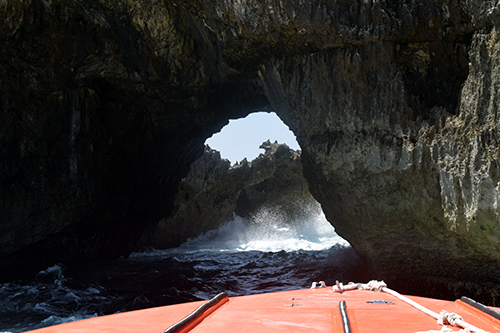 But then, we surged upwards as an unexpected set of big waves rolled through, pounding inside the blow hole. An awesome experience that left all of us dazzled... and completely scared! As for Nature Boy? Unfazed and 100% amused! We passed the end of Little Scrub and were on our way to Scrub Island's Deadman's Bay. It is one of the most dangerous beaches to access by water in Anguilla. And, this particular part of ocean has claimed many boats. 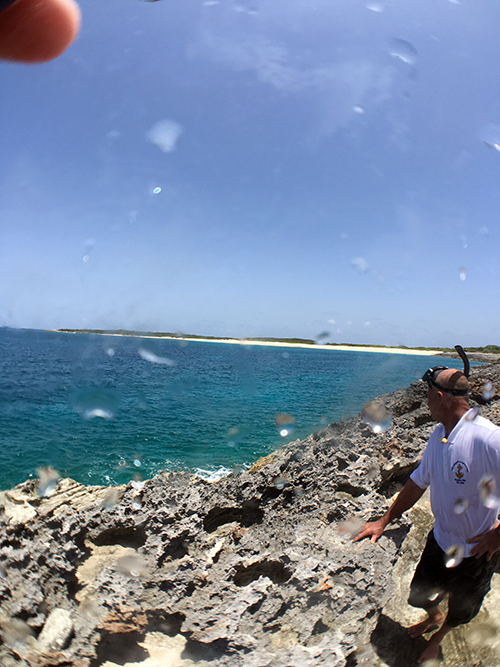 Nature Boy explained, "these are the roughest waters in Anguilla." I believe him, too. 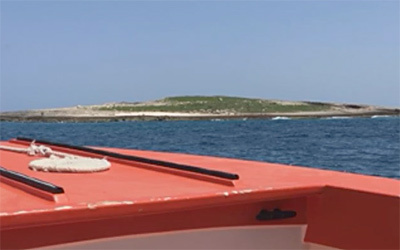 For, it was a perfectly placid, still-water day on the eastern side of Scrub and on mainland Anguilla, but here, on the north side of Scrub? We hit some rough water. I can only imagine the size of the waves on rough days. We stopped at Deadman's for a moment. Nature Boy can take you onto the beach, but the conditions need to be right and he needs to bring a very small boat. 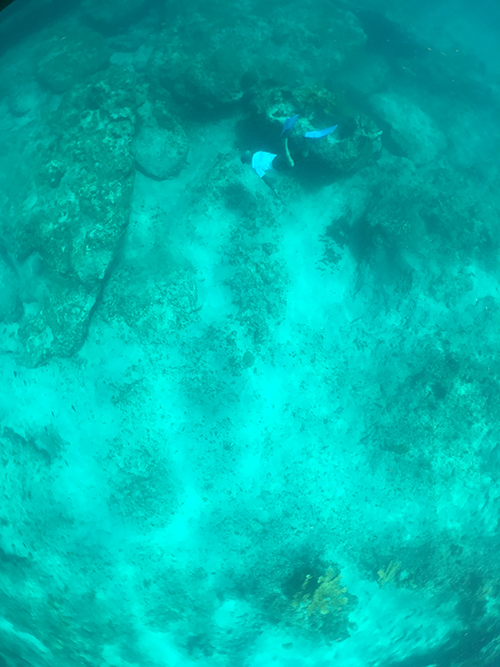 "The beach is surrounded by reef and there's only a small channel, maybe 5' wide. To get there, I need my smaller boat (about 15' long)," Nature Boy explained. The challenges don't end there, however. Deadman's Bay often sees waves in the 15-20' size, so timing your entrance and exit to the beach is everything. "You have about a 7 second window," Nature Boy smiled. I wouldn't trust anyone else to take me there safely! 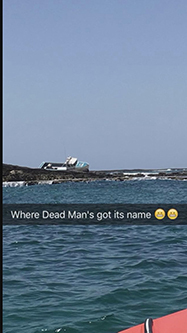 We didn't visit Deadman's Bay on this trip (our boat was too big! ), but the view from the beach, with its rolling green hills, is breathtaking. And, just beyond the bay and beach itself, there is a calm "pond." Here, the water is still and shallow, and the landscape is breathtaking with long stretches of sand. 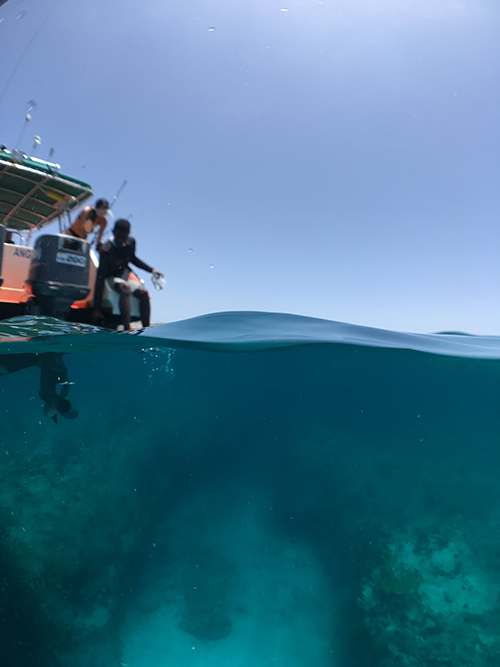 As Nori and Kirmani marveled at the beauty of the beach from the boat, I jumped in with Kirmani's GoPro to get the view from below (see photos above). We sailed on while Nature Boy schooled us on the shipwrecks the island has claimed. 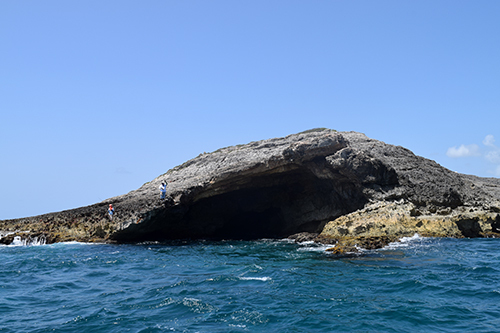 Perhaps the scariest was the story of a Japanese fishing boat that struck sea rocks (photo above) in the dead of night. 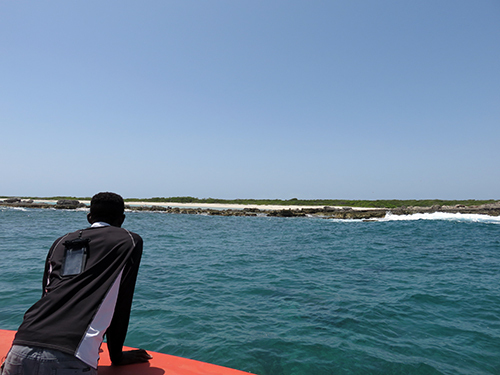 Anguillian fishermen came to their rescue, housing the fishermen and nursing them back to health as the ship sank. The boat remains there to this day! 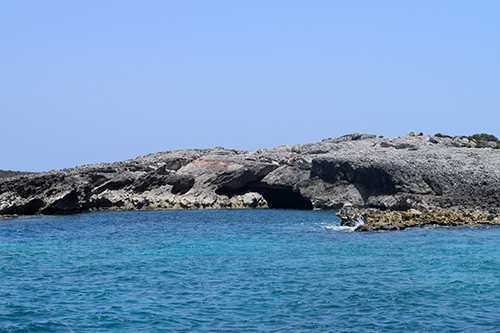 The full tour completed, we were back to the south side of Scrub Island. 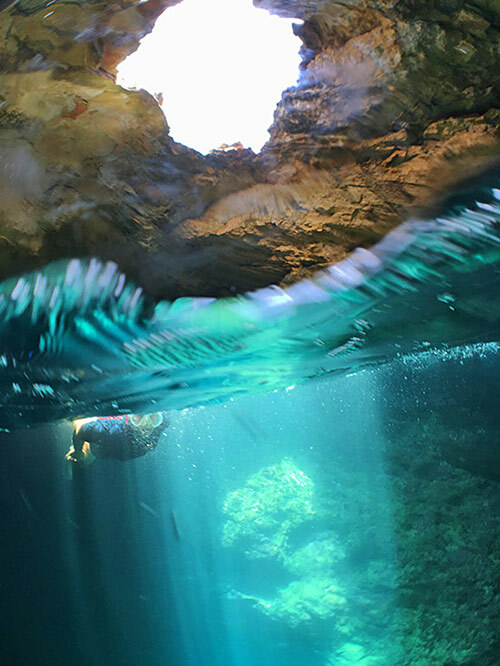 It was time to begin the main attraction of our tour... the underwater sea cave. Tip: Bring fins! There is a bit of a current and the fins help fight that current. 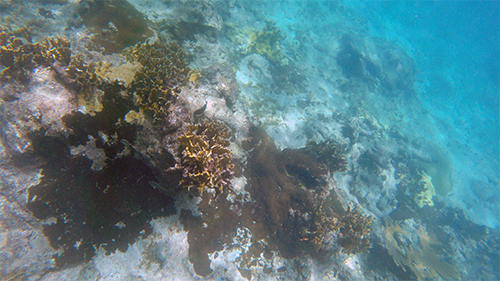 Nervous at first, the crystal clear waters decorated with an array of reefs and fish replaced any fear we had. 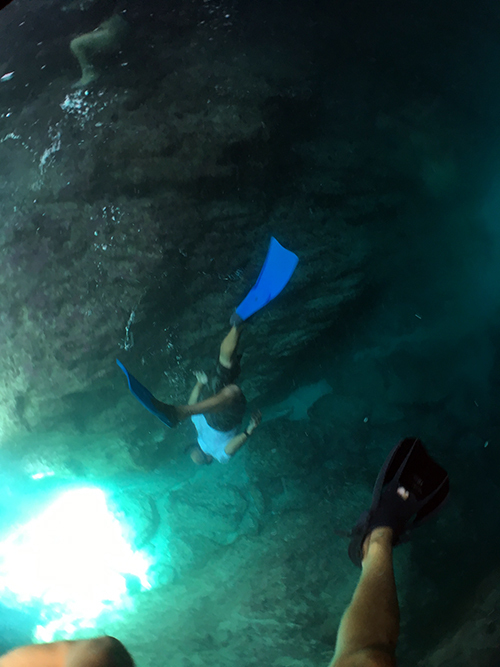 Nature Boy kept us entertained with his free diving skills. Passing between two boulders, we entered the mouth of the cave. 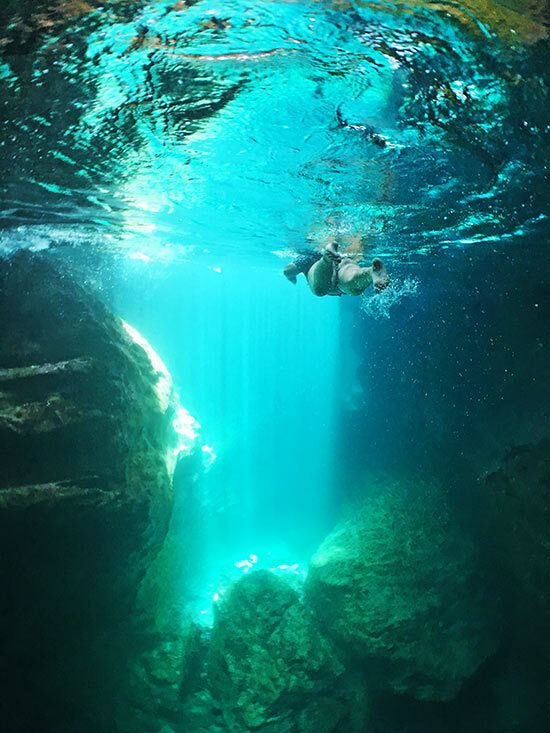 It's generally an easy entry, but do not enter when waves are rushing into the cave as you might get knocked onto the cave walls. If you have any hesitation, ask Nature Boy and he'll swim with you, guiding you and timing your entrance and exit. 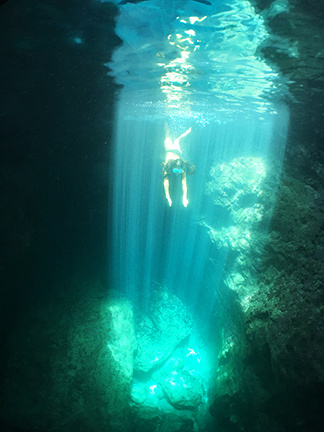 Bright light from above pierces through the sea below. 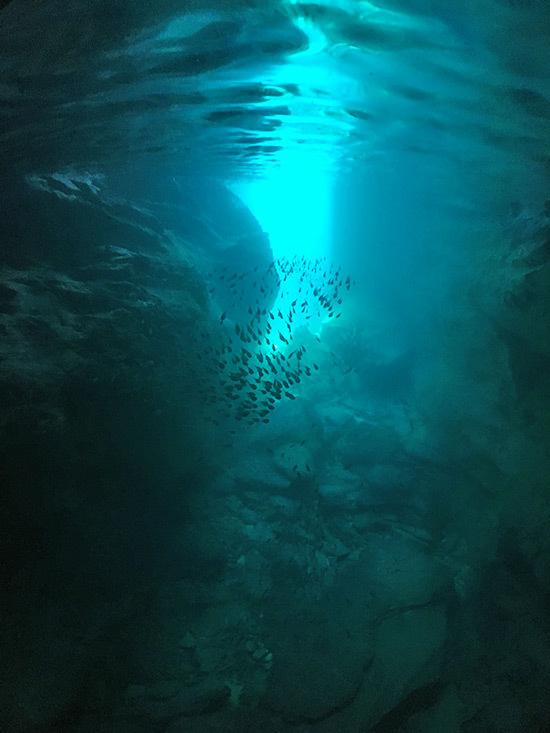 A skylight lights up the water in shimmering shades of blue and dazzles the slick limestone walls with dancing rainbow reflections. 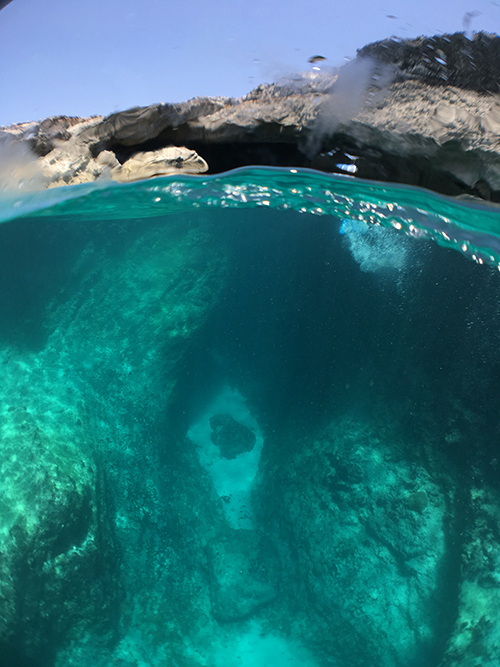 A Whole Different View of Scrub Island! Here's a video clip of Nori inside the cave (below). She is re-entering from the landing described above. We spent what felt like an hour inside the cave. 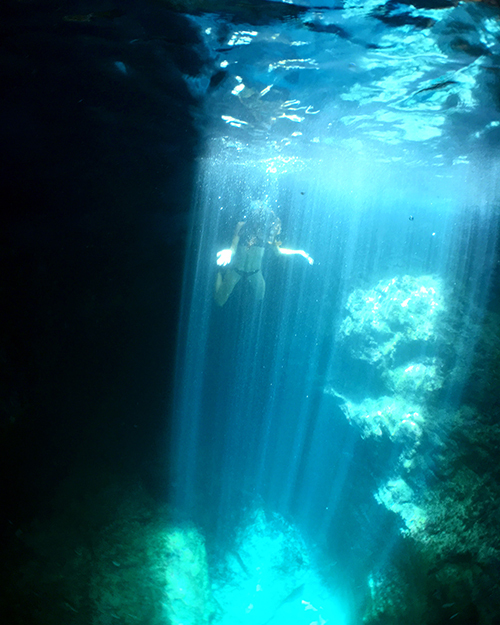 Swimming, diving, spinning... in total awe of this secret beauty. Time stood still inside the cave, and if we had gills, we'd probably stay there forever. One of the Best Beaches of Anguilla - and It Isn't Even on Anguilla! 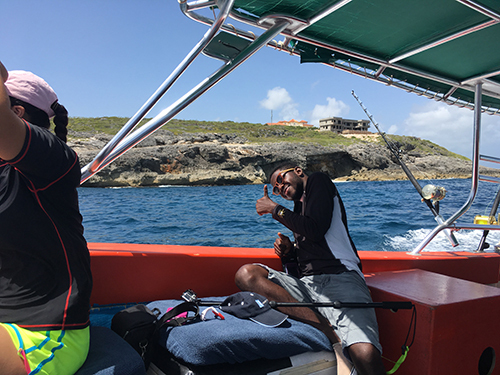 Born and raised in Island Harbour, Nature Boy is a seasoned fisherman and an excellent tour guide. 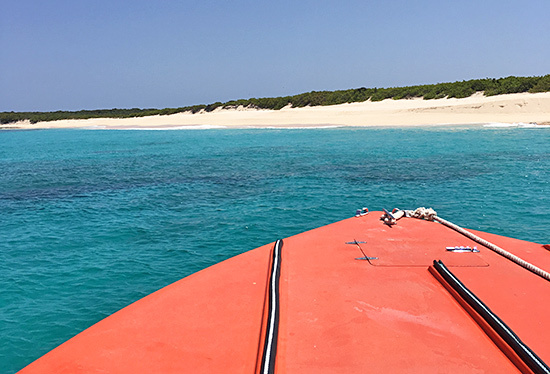 Nature Boy uses his innate connection with Anguilla's oceans and his 3+ decades of experience to navigate and lead his guests. All smiles and with pure passion and expert knowledge, he delivers an unforgettable experience. An experience of a lifetime. One that should be on every Anguilla lover's bucket-list. Nori, Nature Boy and Kirmani! He even put on a show for us on our way back to the mainland, casting all four of his fishing lines! Reeling in The Catch of The Day! As we passed Captain's Bay, one of the lines began to bob, an indicator that something big and exciting was at the end of the line. 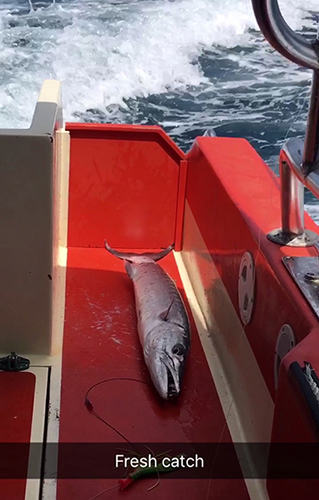 None of us anticipated that it would be a 4 foot long Barracuda! Talk about an exciting end to a day we will never forget! Nature Boy can tailor your trip anyway you would like. Generally, half day tours are about $600 USD. 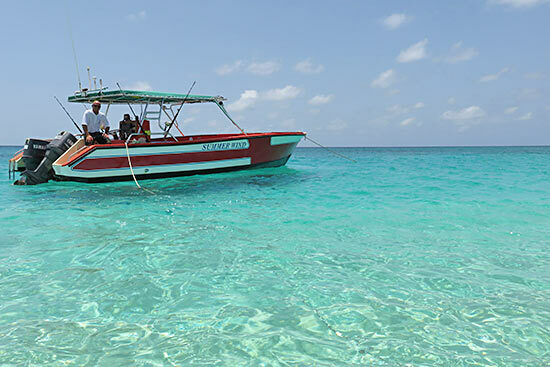 Nature Boy is also available for Sight Seeing, Deep Sea Fishing and Snorkeling Tours as well as Fish Sales .